Will the longest US Government shutdown in history have any effect on Nonfarm Payroll and other reports being released? Traders following the news may have already seen reports speculating about any related effects. With many agencies having been shut down, workers have been furloughed, but still remain employees. The US Bureau of Labor Statistics is funded through September 30, 2019, regardless of government shutdowns and will continue to release the Nonfarm Payroll reports. Nonfarm payroll is released every month, usually on the first Friday after the month ends. It reports the change in the number of employed people during the previous month, but does not include the farming industry. Friday, February 1, 2019 at 8:30 AM ET will be the next release. If the “Actual” number released is greater than what was “Forecast”, it is good for currency. For example, last month, 179K was forecast with 312K being the actual number. For this month, 165K is forecast. There are different strategies to use to trade this news, which can cause moves in multiple markets. Consider the following charts to determine your trading strategy. Always demo trade to mastery before risking live money. 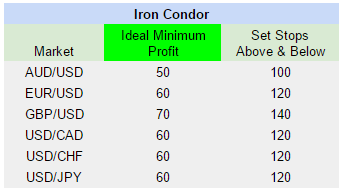 Utilizing Nadex spreads, Iron Condors can be set up for several markets. For example, in the chart below, GBP/USD has a combined potential of $70. Therefore, one spread is bought below with a minimum profit potential of around $35 with another spread being sold above the market with a similar minimum profit potential. The ceiling of the bought spread should meet the floor of the sold spread and be where the market is trading at the time. Both spreads should be entered at the same time. Iron Condors profit when the market makes a reactionary move to the news and then makes a pullback. Maximum profit is made when the market pulls back to center between the two spreads. In addition, stops should be set above and below from where the market was at entry. The following chart shows the combined ideal minimum profit amounts and where stops should be set. These stops reflect the profit potentials listed. 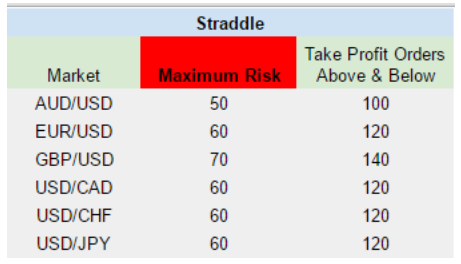 A Straddle using a 1:1 risk reward ratio is another strategy to consider. It is the opposite set up of an Iron Condor. Using AUD/USD as an example, one spread is bought with the floor where the market is trading with a maximum risk of $25. Simultaneously, another spread is sold with its ceiling where the market is trading, also with a maximum risk of $25. The ceiling of the sold spread meets the floor of the bought spread. With a Straddle, the risk is low and doesn’t require stops. This type of trade does require take profit orders to be placed immediately after entry. The table below shows the maximum risk and where to place take profit orders, both above and below based on that specific risk. Ninety percent of the time, the biggest move happens within the first 15 minutes of the news release, but go for as much time as possible. Entry can be any time between 7 AM and 8:15 AM ET, for Nadex Spreads 9 AM, 10 AM and 3 PM ET expiration times. Take profit orders must be set for Straddles immediately after entering. No need to be overwhelmed by news trades; most often, price leads news. Just be sure to enter with the minimum profit potential for the Iron Condor and stay at or under the maximum risk for the Straddle. This will give a high probability setup for each strategy. See the Apex Investing news calendar for more trading opportunities.